the same solutions for every client. Too many financial advisors seem to offer the same solutions for every client. Not us. Before making any recommendations, we take the time to understand your complete financial picture. What are your liabilities? How much money do you have in savings? What are your retirement plans? Only after asking these questions—and getting a good look at your liabilities, protection, investments, and taxes—do we start to make a plan. 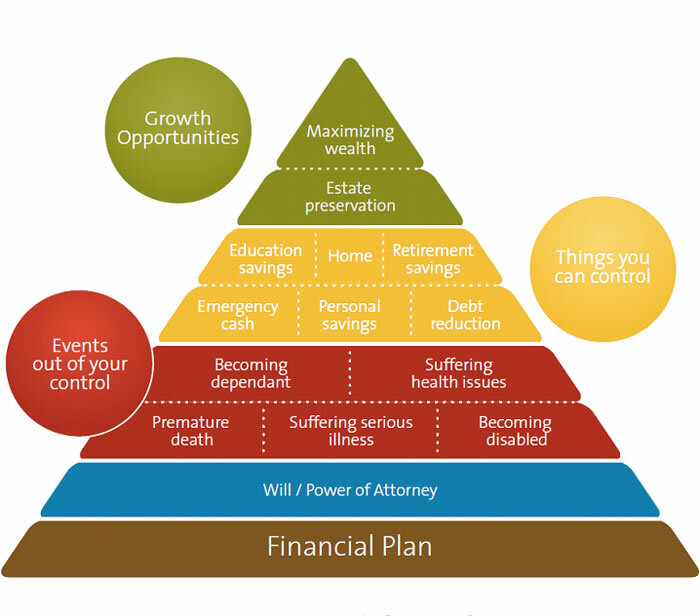 For instance, the best financial planners utilize what's known as "the financial planning pyramid"—see below. This simple tool helps you create a financial plan with a solid foundation, by starting with the most immediate needs: a will (blue), plus basic insurance and protection (red). After that, as you reduce debt, accumulate savings, and begin acquiring more assets (gold), we begin to think more about saving for education, retirement planning, and other ways to maximize wealth (green). This personal approach to financial planning and advice helps you build your dreams, reach your goals, and bring financial success to life. Contact us today and let's get to know each other.